Peaceworks: Thank a Veteran for Your Freedom? 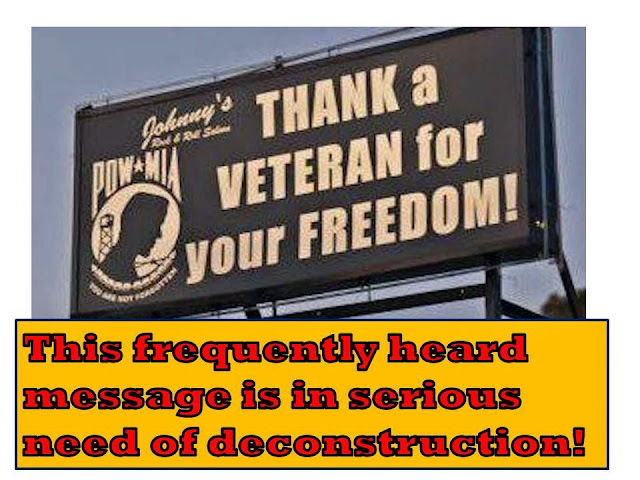 Thank a Veteran for Your Freedom? We hear messages like this so often, starting in childhood, that most of us hardly give it a thought when we hear this said, or see a message like this on a billboard. After all, on Memorial Day, July 4th, Veterans Day and many other times throughout the year, virtually every politician across the spectrum will genuflectively spout this or other, similarly clichéd, homages to veterans. While respecting the good intentions of most of our fellow citizens who’ve been in the military, if we hope to see our country embrace foreign and military policies that enhance our real security, we need to pursue a more thoughtful understanding of the role that the U.S. military plays in the world. We also need to look closely at the nature of our precious “freedom,” as well as identifying the real threats thereof. Before we go there, it should be noted that many who urge everyone to “Support our troops,” really mean “Support the wars they’ve been ordered to fight.” And many of these same politicians are actually not very good about supporting those who’ve come home from war physically and psychologically scarred. Our VA system is chronically underfunded and there are way too many veterans living on the streets, homeless, never having received the help they needed to recover from the traumas of war. Do U.S. Wars Defend Our Freedom? While we are taught from childhood that our military is in the business of defending our nation, the reality is quite different. All wars fought, at least for the past seven decades—and there have been many—have involved U.S. interventions in the affairs of other countries far from our shores. In fact, the last time the United States was invaded was fully 200 years ago, during the War of 1812. We are blessed with oceans to the east and west, friendly neighbors to the north and south and a general lack of enemies threatening military action against us. Where the U.S. has involved itself militarily around the world, from Vietnam to Iraq, from Somalia to Colombia, from Panama to Pakistan and beyond, the troops or planes have not been sent to fight an aggressive power threatening our security or freedom. Rather, these invasions, coups, counter-insurgency wars and proxy wars have been fought for geopolitical advantage and in pursuit of the commercial interests and profits of influential transnational corporations. To the extent that there is a dislike for the United States in places around the world, this is most likely the results of past aggressions by our government. or support for despotic regimes. Our wars create more enemies than they eliminate. There would be no ISIS right now if not for the American invasion of Iraq. Likewise, it was the U.S.-Saudi proxy intervention in Afghanistan in the 1980s that led to the Taliban and Al Qaeda. U.S. taxpayers spend a pretty penny on what’s billed as “defense;” more than any other nation, in fact, more than the next nine biggest spenders, combined. What we are buying, however, is neither defense nor freedom. Rather, we are enriching the Military Industrial Complex and, in many parts of the world, helping maintain a status quo that is much more about entrenched wealth and power than it is about anything else. Who Should We Thank for Our Freedom? When this republic was founded, slavery was legal, women were virtually the property of their husbands or fathers, and, in many locations, only white males who owned real property were allowed to vote. The protections enshrined in the Bill of Rights were only applied at the Federal level. There are countless organizations we must salute, with the list including the ACLU, the NAACP, NOW and numerous others. Many of these struggles continue to this day. LGBT rights are still not enshrined in Federal statute. Nor are they recognized in all states. The civil rights movement made great strides in the 1950s and 60s, but, as we all are painfully aware, there is still much work to be done to ensure equal rights for all citizens regardless of their skin color. Another aspect of our freedom is the right to breathe clean air, to drink clean water and to live in an environment that does not make us sick. We must applaud those who struggle to protect our rights to a healthy environment. And clearly, there is still much work to be done to ensure our privacy, another area in which many good people and organizations deserve recognition for their work. Freedom, if it is to be understood fully, is not simply a matter of ensuring a level playing field for all under the rule of law, as important as that is. Another critical freedom is the “Freedom from Want,” as articulated by President Roosevelt in his famous 1941 Four Freedoms Speech. Many have struggled long and hard to ensure workers receive adequate remuneration for their labor; that they have safe working conditions; and that there is a social safety net that provides a modicum to those who cannot work or cannot find work. These rights are still a work in progress. Likewise, Roosevelt declared that we should all have the “Freedom from Fear.” He defined this as “a world-wide reduction of armaments to such a point and in such a thorough fashion that no nation will be in a position to commit an act of physical aggression against any neighbor—anywhere in the world.” He made this statement before nuclear weapons had emerged as the ultimate cause for fear, threatening omnicide. Clearly, though, the logic of his speech must be applied to these as well. Activists who have worked tirelessly for decades to promote disarmament in general and nuclear disarmament in particular should also be recognized for their contributions, although much more work remains to be done. As we consider the origins of our freedom, it is important to be clear as to who is working to promote and expand that freedom, and also to recognize who is seeking to restrict it. It seems that those who are boisterous cheerleaders for war, and want to give a virtual blank check to military spending, are often on the side of restricting freedom. From attacking workers’ rights to making voting more difficult, from opposing marriage equality to attacking reproductive rights, from cutting food stamps for the needy to opposing minimum wages we see constant attacks on our freedom coming from the Right. Those who urge us to “Thank Veterans for your Freedom,” seem to believe that the biggest threats come from without and must be resisted with military force. Looking closer, far greater threats come from within our own society. So, we all can, and should, be freedom fighters. There is much heavy lifting to be done today. With much at stake, we are the ones who must each do our share.